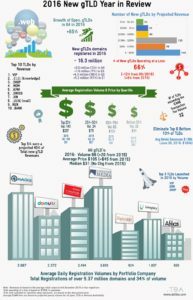 Registration analysis of new generic Top Level Domains as of July 24, 2014, there are 334 delegated new gTLDs. .XYZ has the highest average daily registration volume with 5,330 registrations per day followed by .BERLIN with 1,042. 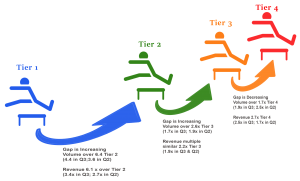 Both of which offered free domains increasing their numbers which is difficult to compare to other TLDs who only have paying registrants. .CLUB at an average of 743 per day along with .WANG at 617 (with a first appearance), and .GURU at 361 per day are paying registrants. 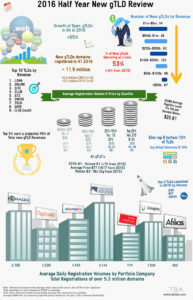 Overall, the average daily registrations of new Top Level Domains for the top half of registries is approximately 191. However, if you eliminated .xyz and .berlin from the top half the average per registry falls to 116. 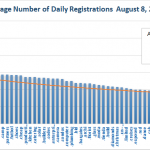 The bottom half daily average number of registrations is 24. 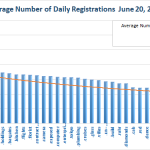 There is clearly a downward trend in the average number of registrations per registry by quartile and this period reflects the same slow downward trend. Hopefully this is only because its summer holidays.